New Delhi: In a press interaction in New Delhi the Principal Scientific Adviser to the Government of India, Prof. K. Vijay Raghvan shared details of the nine national missions guided by the Prime Minister Science, Technology & Innovation Advisory Council (PM-STIAC). Prof. Raghvan said that science and technology is the fulcrum for the levers of government to effect social and economic change. 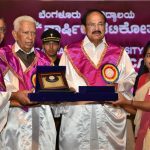 For this, scientists and society must connect closely; build stronger foundations in education, fundamental research, applications in agriculture, health, environment, energy etc. The PM,s STIAC aims to facilitate, through its missions, the process of collaboration and focus needed to solve complex problems in a reasonable time-frame. Prof. Raghvan further stated that the nine missions of national importance through the PM-STIAC, aim to understand and conserve our biodiversity and develop sustainable processes, leverage precision health for personal wellbeing, recover wealth from waste, develop and use artificial intelligence, quantum computing, connected mobility solutions and other technologies to address frontier scientific questions and our challenges, thereby enabling sustainable development for India and, indeed, the planet. The PSA also detailed new policies and programs which are also being implemented by the PSA’s office as guided by the PM-STIAC, to build on India’s rich cultural and traditional practise, to position India as a pioneer in the areas of biodiversity research, deep ocean exploration, teaching science in our languages, to create an impact at the grass-roots and become a modern yet inclusive economy. Prime Minister Shri Narendra Modi recently referred to his Science, Technology & Innovation Advisory Council (PM-STIAC)’s work on challenges in science and identifying solutions for societal problems through technology and innovation. The Prime Minister’s Science, Technology and Innovation Advisory Council (PM-STIAC) in an overarching Council that facilitates the PSA’s Office to assess the status in specific science and technology domains, comprehend challenges in hand, formulate specific interventions, develop a futuristic roadmap and advise the Prime Minister accordingly. PSA’s Office also oversees the implementation of such interventions by concerned S&T Departments and Agencies and other government Ministries.